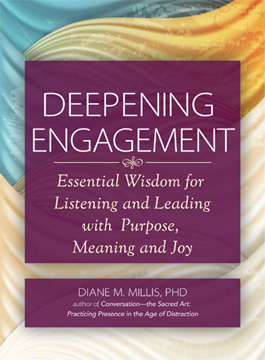 Editor’s note: In her new book, “Deepening Engagement: Essential Wisdom for Listening and Leading with Purpose, Meaning and Joy,” leadership consultant and coach Diane M. Millis offers advice on how we can engage more deeply with our true selves, one another and the communities in which we live and work. In the following excerpt, she explains how to ask meaningful questions. Our pragmatic, problem-solving culture values people who know things and tell others what they know. In such a culture, having to ask is perceived to be a sign of weakness or ignorance. Asking temporarily empowers the other person in the conversation and temporarily makes me vulnerable. Those with the most authority tend to tell more often than ask, and those who ask are often viewed as either naive or bothersome or both. Case in point: Just last week, a client recalled how her boss told her not to ask so many questions during meetings. He insisted, “It makes it seem as if you don’t know what you’re doing.” Yet the primary benefits of asking, according to Schein, are that we generate better ideas, make fewer errors in judgment, and increase our agility. Do you really think that [x, y, or z] is a good idea? Have you always been so overly concerned with what your boss thinks of you? Have you thought about using this approach instead? We tend to offer thinly veiled advice through our questions instead of seeking to better understand another’s perspective. How do you like school? (we ask the children we meet). What is your major? (we ask the students we meet). What do you do for a living? (we ask the adults we meet). What do you like most about the grade you are in? What are you enjoying learning about this semester? Where are you finding joy in your life these days? Such questions cannot be answered automatically. They require real-time reflection. When asked, the other person may respond, “I need to think about that.” Or “I’ve never thought about that before.” You know you’ve asked a really good question when you hear that response. And that is the second part of Dave Isay’s wisdom: Not only do we need to have the courage to ask meaningful questions, but we also need to have the patience to listen closely for the answers. If you think you already know how the other person will respond, try to come up with a different question. Begin your question with words and phrases like these: how, what, where, when, in what ways ... or tell me more about ... Open-ended questions tend to evoke more robust responses because they cannot typically be answered yes, no, or in a few words. Pay attention to key words and phrases that seem to have particular energy and meaning for those with whom you are speaking and incorporate their language into your question. For example, What are you getting jazzed about these days? What hit you at your core in that meeting? Tell me more about what floats your boat in this design. Maintain awareness of a person’s nonverbal responses and incorporate your observations into your questions. For example, I notice how your eyes lit up when you talked about yesterday’s presentation. What was the highlight of that presentation for you? Go beyond the first response. Encourage others to keep noticing and naming what’s at the core, the heart of the matter for them. For example, Tell me more about why that is important to you. Continue to listen patiently as our deepest truths are often difficult to put into words quickly and continue to emerge over time. What is a question you would most like to be asked and by whom? This day, in each of the conversations you participate in, try to ask at least one heart-awakening question. As much as possible, tailor your question to the unique aspects of the person -- being attentive to his or her manner of speaking, preferred phrases, and expressions. Excerpt is from “Deepening Engagement: Essential Wisdom for Listening and Leading with Purpose, Meaning and Joy” © 2015 Diane M. Millis. Permission granted by SkyLight Paths Publishing, www.skylightpaths.com.